Chiropractors are musculoskeletal specialists and are trained as diagnosticians and primary care physicians we can treat your child’s ear ache and your grandma’s arthritis. 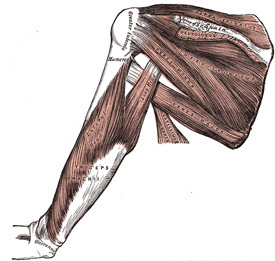 Though our every day specialties are back pain, I thought I’d branch out a little from the spine and address some other conditions that chiropractors treat, starting with a rotator cuff strain. When muscles tear we call it a strain. When ligaments tear we call it a sprain. With injuries of this type it’s not usually one or the other that tears it’s more complicated, so we’ll often refer to sprains and strains interchangeably. Most strains even the ones people would consider bad are only grade one tears and can heal in as little as 2-6 weeks with proper care. Think of a really bad ankle sprain you’ve seen. The person is usually up and walking around in at most a couple of weeks. 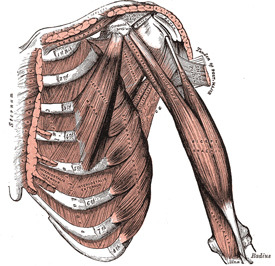 The rotator cuff is a group of muscles that help you to move your shoulder. If you’ve ever tried moving your arm around without your shoulder you’ll realize how important this group is to every day life. From brushing your teeth and dressing to typing and eating, there’s not much that we do that isn’t affected by the rotator cuff. Rotator cuff strains can be caused by a single trauma like in contact sports or it can occur due to repetitive misuse like throwing a ball or lifting weights improperly. In these repetitive situations there are things you can do that can minimize your risk such as proper form, equipment, warm-ups and stretching. When they aren’t prevented you need help. Before treatment your chiropractor should examine you. Some of the common signs and symptoms he’ll be looking for are, a popping or tearing sensation at the time of injury, pain with active muscle contraction, and a weakness in just one side. He may take x-rays to rule out a fracture especially if trauma was involved. In the first few days after an injury like this he’ll focus on pain relief and reducing swelling so your chiropractor will have you rest it and ice it, he may use e-stim for pain relief or recommend an over the counter anti-inflammatory agent. Your chiropractor will want to get your shoulder moving as soon as possible to avoid the risk of frozen shoulder syndrome. He will likely begin with just mobilization stretching and massage before moving on to chiropractic adjustments. When you injure an area you are more likely to injure it again, so your chiropractor will probably give you some strengthening exercises to protect from future injury. Most sprains/strains will heal in 2-6 weeks with proper care. If you have injured your shoulder your chiropractor can help, and you can avoid the hassle of getting a referral to a specialist by going to one first. This entry was posted in Chiropractic in General and tagged Chiropractic, Chiropractor, frozen shoulder, rotator cuff, shoulder, sprain, strain on November 20, 2008 by cmnacnud.